DECK-O-JOINT is an attractive and decorative vinyl control joint. Economical DECK-O-JOINT is long lasting and trouble- free. It resists most chemicals. A light hose- down keeps it bright and clean. DECK-O-JOINT will not whip or warp. It protects against cracking and buckling. Generally, damage caused by excessive water flow through joints is reduced. 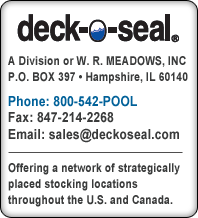 The advanced design and exclusive self-leveling of DECK-O-JOINT provides a protective ledge, which locks to concrete and seals against seepage and excessive water flow. This helps prevent and reduce water damage in the joint caused by excessive flow through. DECK-O-JOINT also offers maximum sealing. DECK-O-JOINT is designed to provide the quality finishing touch to patios, driveways, sidewalks, pool decks or wherever concrete is used. Exclusive channel design prevents excessive seepage and water damage. Self-leveling … locks to concrete and adjusts for slab movement. Attractive and decorative finishing touch. o Protects against cracking and buckling. Eliminates need for a separate base unit. (Black and Redwood by special order). Joint Preparation…Ten foot lengths, cut to size, are simply put into position before tamping. For a professional finish to the job, score along the edges of the top joint with a fine edger tool. DECK-O-JOINT is now a part of the surface with built-in protection and beauty. Short runs require no staking.